Customized with all of your party details, We can print for you or add your special touch by printing yourself. Check invites off your to-do list and order now! As soon as your order is shipped, you will receive a shipping notice with a tracking number from Etsy. PRINTS: Package will be shipped safely and securely. Cards are packaged in a plastic sleeve and sandwiched between cardboard to prevent bending then mailed in a stiff cardboard mailer. DIGITAL INVITATION: file available in single form and also can be formatted to fit 2 on a single page for easy home printing. For quickest turnaround, be sure to include accurate event details in notes. Notes: If you would like to add an image, send the high-resolution, un-cropped photo via Etsy convo. A professional graphic designer will create your personalized proof. Your first proof will be sent in 2-3 business days. 24 Rush is available for an additional fee. 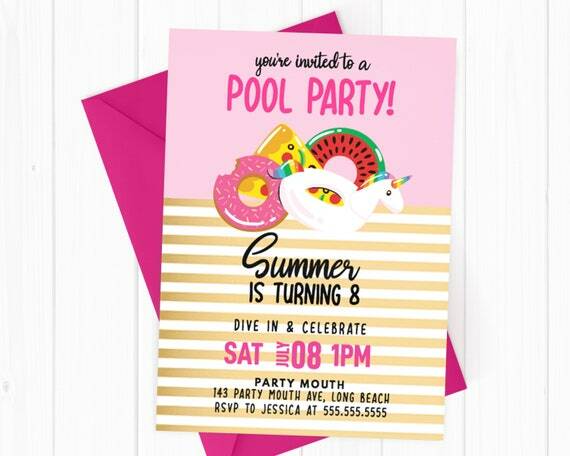 Grab everyone’s attention and make the most of your party with high-quality invitations today!